In addition to Azimut Benetti Group’s 43.6m Benetti Vision superyacht Checkmate making its world debut at the Fort Lauderdale boat show, its new Azimut 80 motor yacht also made its US debut. Azimut Yachts’ new 24m motor yacht is available in four styles offering different interior motifs and furnishings; these include the Portofino, Dolce Vita, Firenze, and Riviera versions. The new motor yacht is designed by Stefano Righini and Achille Salvagni Architetti. She features a welcoming main deck layout with an open galley, and the interior is bathed in natural light thanks to two full-height windows in the dining room. The interior decor employs a mix wood detailing ranging from soft shades of oak to darker walnut. Built in composite to CE class, Azimut 80 accommodates eight to nine guests in four staterooms and offers five bathrooms while crew and captain are accommodated in two cabins. The owners’ stateroom features a full-beam en suite bathroom – an impressive feature on a 24m yacht – found astern of the stateroom. Adding to this ‘large yacht amenities in a small yacht’ feel, this bathroom hosts a Jacuzzi tub, central glass shower stall and double sinks. 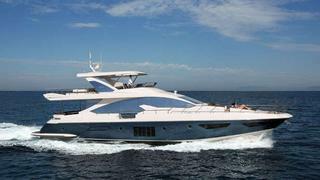 Twin MAN engines power the Azimut 80 to a top speed of 30 knots and she cruises at a respectable 26 knots.